Sarah: Nothing like shooting blind through an infared filter for a challenge, add a 2 year old and bright sunshine and it’s even harder, but came away with some great shots, even if I needed to sacrifice my hair bunch to attach the lens cloth over the filter to keep the sunlight out. It is a very popular area and had to fight through buses of tourists to get prime sites – knew we usually went in winter for a reason! Well worth it though and got a different shot of a very photographed place, some good kiddie fun with katie and a nice drink in a cosy pub. All very Scottish! Ian: The problem with trying to shoot at a place like Killin is the immediate dangers to an almost 3 year old who loves playing with water. So we took it in turns to watch her while the other went and did the business with some of the most spectacular scenery in Scotland. The falls are just amazing. Everywhere you look gives a different perspective of the area and it is well worth a visit if you have the chance. I gave Sarah a shot of my Infrared filter and let her get stuck into the diverse methods of lining up a shot when you can’t see anything! After shooting many waterfalls and climbing the wall to the other side of the banks we decided to get a drink from the local pub as we have done several times before. Good grub and an open fire! 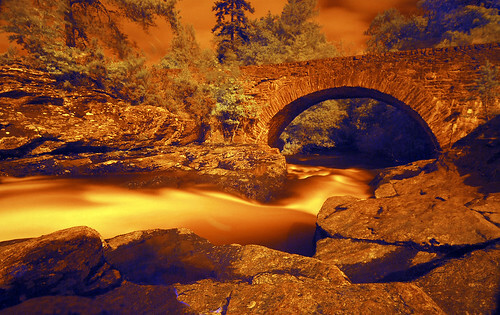 I actually won a Dewars Whisky competition last year with an infrared shot of this area. Sarah came third! 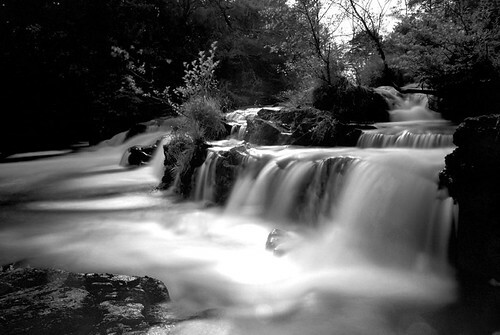 Places to eat: Falls of Dochart Inn for a quick swally and there is plenty of other places too – check the link below!